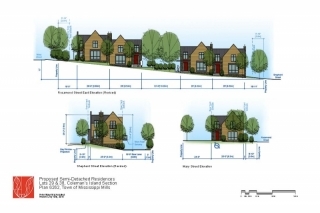 This project involves the design of a two separate three-storey, 4,700 square foot semi-detached residences to be constructed on a site located at the corner of Rosamond Street East and Shepherd Street in Almonte, Ontario. The design seeks to create an residential architectural form that connects with the character of the surrounding island through the use of prominent gable ends, stone and horizontal siding. 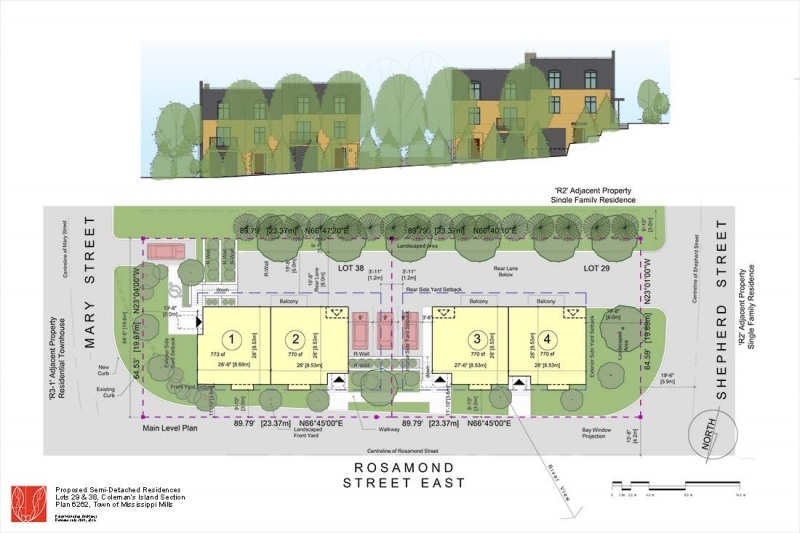 The site is steeply sloped along Rosamond Street East and the grade change has been utilized to provide a laneway with private garages for each unit on the rear, and a more modest two-storey front façade with front porch and canopy facing the designated heritage properties located across the street. Furthermore, all the required site parking is screened from view by the building massing and soft landscape features.